The structure was originally built in 1948, serving as the Elon Post Office for 17 years. Providing more than three times the space of Elon’s previous post office building, it was constructed at a cost of $15,000 and served approximately 7,000 people in parts of Alamance, Guilford, Rockingham and Caswell counties. 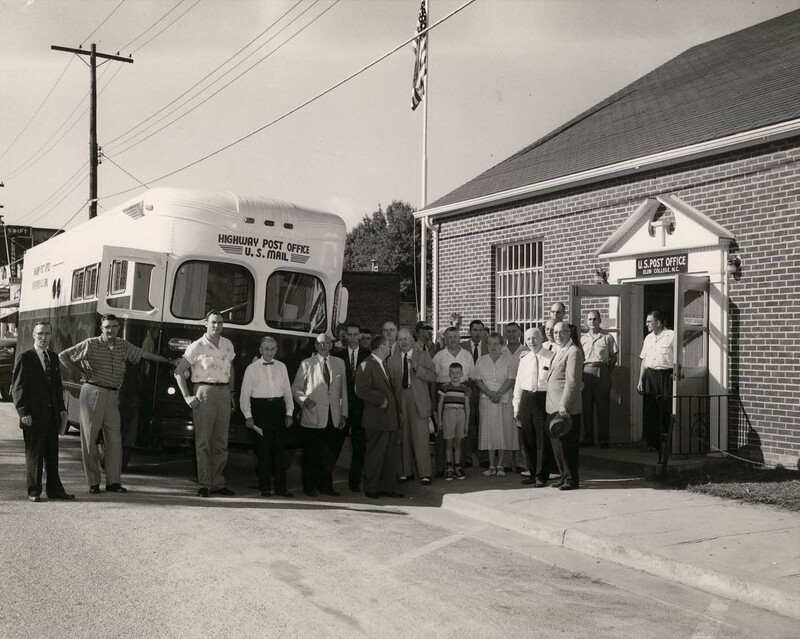 On September 14th, 1957, the building was a stop on the maiden voyage of the Highway Post Office bus that ran from Kinston to Greensboro. These buses were essentially mobile Post Offices, receiving and dispatching mail from all post office locations along their route while clerks sorted mail in the vehicle while it motored between stops. In 1965, Elon’s Post Office again received an upgrade, moving to it’s current location down the road on Williamson Avenue. After that, the old post office building’s function radically changed, becoming a pool hall known as the College Ku Klub. Ten years later, in the spring of 1975, the structure became a bank, first housing the Bank of North Carolina and then a local branch of Fidelity Bank. In 2007, the Pendulum student newspaper took up residence, moving in from its upstairs location of the Moseley Center. The spot was convenient both because of its proximity to McEwen Communications building and the resources in the School of Communications, but also because the bank vault’s sound proof environment made an excellent room for audio and video productions. The now demolished 63-year-old structure will be replaced by a three-story building called the Elon Town Center, which will include the campus shop, several retail businesses and the new Pendulum office. While the downtown construction is changing the face of the town’s identity, the building which no longer stands on Williamson Avenue represented Elon’s past as well as its continuing evolution. This entry was posted in Campus buildings, Student organizations, Town history. Bookmark the permalink.